How do you increase user acceptance for any application? One way is to reduce the amount of data entry the user is responsible for. Most of us would rather spend our time ‘doing’ rather than pounding on a keyboard. There are many places you can use Microsoft Dynamics 365 workflows to help the user out and it doesn’t have to be complicated to produce some benefit. An example of this is copying an address using Microsoft Dynamics 365/CRM workflows. One of the most important pieces of information in Dynamics 365 is the Account address. For many organizations, tracking at least two addresses is a requirement. You can expose two sets of addresses on the Account form and designate each with a ‘friendly’ name. Some businesses want to maintain consistency so that the first address displayed is always the ‘Primary’ address or the ‘Bill To’ address, while the second one might always be labeled as ‘Mailing’ or ‘Ship To’. 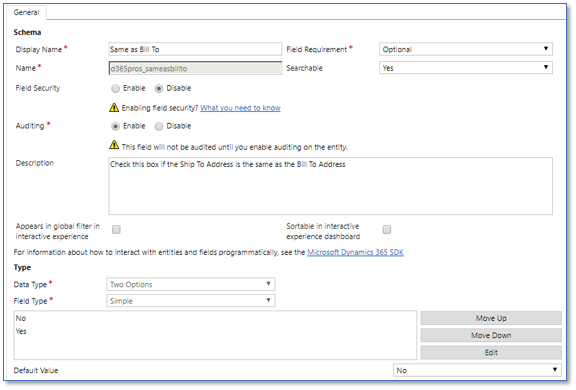 Regardless of your choice of convention, if the second address is often the same as the first one, why not make it easy for the users to have Dynamics 365 take off the entry of the second address via a workflow? Next, add the field to the Address section of the form, right above the 2nd address fields. On the ‘Formatting’ tab of the Field Properties, select a format to display the field as a radio button, check box or drop down. Save and publish your form and then navigate to ‘Processes’ in the ‘Customizations’ or ‘Solutions’ areas, depending upon where you do your configuration. 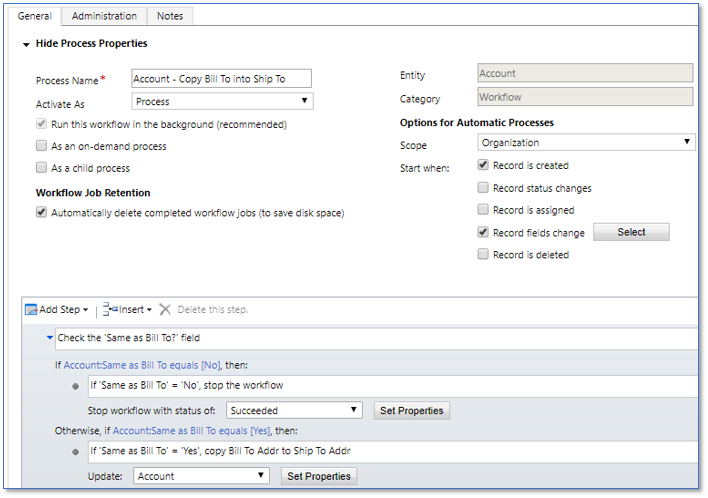 In the workflow steps area, our first step is to check the value of the ‘Same as Bill To’ field and to stop the workflow if the value is ‘No’. When the user checks the ‘Same as Bill To’ box / sets the value to ‘Yes and saves the record, the workflow will copy the address info in the background. Naturally, there are other things that could be added to this such as using a Business Rule to lock the ‘Same as Bill To’ field if there is data in the 2nd address field, clearing out the 2nd address fields if the user changes the ‘Same as Bill To’ to ‘No’ (to force the user to make sure the 2nd address data is valid), checking to see if the 1st address does contain data before proceeding with an update to the 2nd address, etc. Even simple workflows can provide a lot of value for a small investment in time. And if you need to add more conditions or make it a little more sophisticated you can do that, too.